WHAT'S NEW WITH CHRIS? 2 NEW CRAFTSY CLASSES! I’m excited to share these empowering techniques with you! 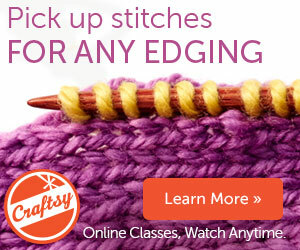 "Picking Up Stitches" launched Nov. 23, and is currently available for 50 percent off the regular class price! Click on the image above, or here to learn more and/or register. "Finishing Skills" launched Dec. 14, and is currently available for 50 percent off the regular class price! Click on the image above, or here to learn more and/or register.